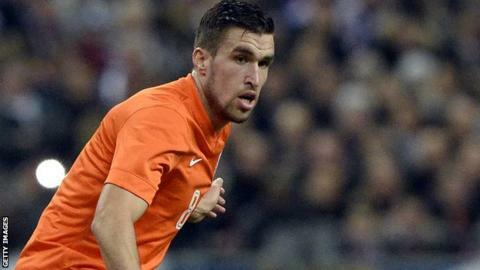 Roma owner James Pallotta insists midfielder Kevin Strootman will not be sold to Manchester United. The 24-year-old Dutch midfielder has been linked with a January move to Old Trafford, where he would join up with former Netherlands boss Louis Van Gaal. "It is just not happening," Roma's billionaire owner told BBC Sport at the Leaders in Football Conference. "I have told the papers that they should stop wasting paper. We don't have any interest in selling Kevin." Strootman is currently recovering from the knee injury he sustained in March which forced him to miss the 2014 World Cup. In an interview that will be broadcast on BBC Radio 5 live Sport on Wednesday, Palotta hinted that although United had made an inquiry for Strootman, even a bid of £75m would not tempt Roma to sell the player. "Obviously as business people when people call us and say 'we want your player' you are going to listen to them," Pallotta added. "You have to do that, that is the business side. That doesn't mean you are going to make a decision that [an offer of] £75m, bang you hit the bid. That is not the way it is going to work, it is not the way it does work with us." When asked if money would eventually talk, Pallotta added: "For others, maybe. "Our view is that we want to put a great team out there, but we are not saying 'we have to make a ton of money'. Our goal across the board is stability."